June 12, 2013 | David S. Maldow, Esq. 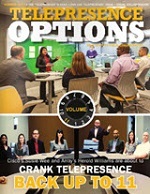 Vidyo has been the source of truly disruptive changes in the videoconferencing industry. Their early work in developing the SVC standard first allowed for business class videoconferencing over the lossy public internet. The impact of this work cannot be understated as SVC is no longer the "weird uncle of videoconferencing" (as CEO Ofer Shapiro likes to say), and is now being adopted and developed by most mainstream videoconferencing vendors. The second major Vidyo revolution was the use of their non-transcoding routers in the place of traditional MCUs, which allows for massive scalability, transforming VC from something that only exists in fancy meeting rooms, to something that can exist on every desktop and mobile device. However, something has been missing. There are two major areas I focus on when reviewing solutions. The first is functionality (which Vidyo has in spades) and the other is design and user experience. To be clear, Vidyo's existing UI isn't bad, but it is several years old, and in this rapidly changing environment, that is more than a bit dated. With Vidyo's technology now fully virtualized, they are ready for a complete makeover of their user interface, user experience, and workflow. I spoke with Joan Vandermate (VP, Product Marketing at Vidyo) to get the details regarding today's wave of announcements. As a heavy user of desktop videoconferencing, I was first interested in the new desktop UI. It has a refreshed look and feel, which is more in-line with what we expect from today's sharper and cleaner interfaces. Even more importantly, it incorporates several new features which allow for a more natural workflow. The original VidyoDesktop was a bit of a purist VC application. For example, it didn't have integrated instant text messaging. Vidyo simply appeared to be hyper-focused on the VC, and willing to leave other aspects of the meeting experience, like IM, to UC vendors. But times have changed, users have spoken, and Vidyo is listening. We like IM in our video clients, it allows us to share links, troubleshoot audio issues, etc. The new user experience includes a number of features, some of which will be demonstrated this week at InfoComm (Vidyo Booth #1581). These new items are a mix of long awaited, and now really required, core features, as well as some innovative (and perhaps Vidyo-only?) new capabilities. Here is a non-comprehensive list of a few highlights. Mobile client - Invite via text message:�Invite anyone in your phone/tablet's address book to a Vidyo meeting, which they can join from their mobile device. I am very interested in this demo, as I do not think I have ever seen a great implementation of this concept. In-browser Conferencing:�A web based option to the Desktop client. It isn't WebRTC, but many users are more comfortable with a web-plugin than a full client download. VC vendors simply must provide this option. Desktop Client - Improved Contact list:�Better invite support, IM support, etc. Unified Lync Experience:�Previously Vidyo customers could create a Vidyo meeting from within Lync, but it would launch in a separate window. Now, Vidyo will power the videoconferencing experience within the Lync client for a more natural and intuitive workflow. Outlook Integration:�One click Vidyo meeting creation from within Outlook. Sharing and collaboration app -�Provides white board and mark-up application for content sharing during meetings. In addition to these well appreciated experience and workflow improvements, Vidyo is announcing a new small form factor room system and an updated VidyoPanorama platform. The new VidyoPanorama 600 is priced at ~$5,000 per screen, supports 6x1080p60 and is significantly easier to install and configure (see above). Despite the fact that one of Vidyo's major strengths is that their software does not require custom hardware, there are some situations where a dedicated appliance makes sense. Meeting room videoconferencing may be shifting to a software based template, but at this time many users are still looking for high quality hardware VC appliances. 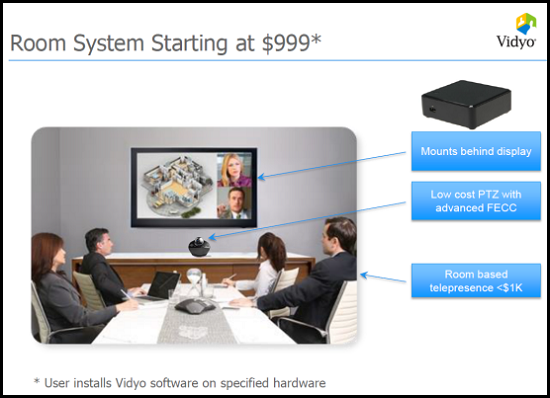 The unit pictured above, is Vidyo's take on the room system of 2013. To put it into scale, that is a standard USB slot on the front. The unit is only about 4 inches wide and 2 inches tall, about the size of a drink coaster, and can be easily hidden behind the wall display. It is designed to work with USB enabled cameras / speakerphones for a quick and easy setup. 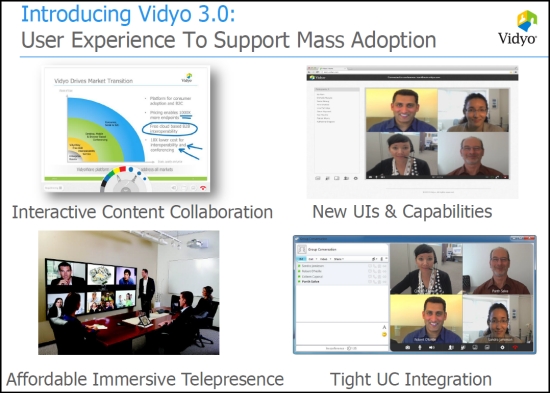 Finally, Vidyo is announcing the success of a massive videoconferencing deployment for a particularly cool user group. The group is CERN, as in the guys who�invented the world wide web�and are currently making amazing breakthroughs in particle physics with their�Large Hadron Collider. In a few short months, CERN ramped up from a small test group of Vidyo users, to a full VC environment with over 20,000 client downloads, and daily peaks of up to 750 concurrent users. This type of quick scaling would have been impossible with traditional hardware solutions, due to the expense of purchasing, configuring, and maintaining enough hardware endpoints and infrastructure to support that many users. 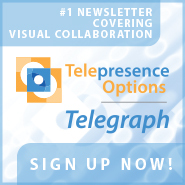 �Expect more details to come, as we plan to follow up up with Vidyo at their booth this week at InfoComm. Vidyo has been the source of truly disruptive changes in the videoconferencing industry. Their early work in developing the SVC standard first allowed for business class videoconferencing over the lossy public internet. The impact of this work cannot be understated as SVC is no longer the \"weird uncle of videoconferencing\" (as CEO Ofer Shapiro likes to say), and is now being adopted and developed by most mainstream videoconferencing vendors. The second major Vidyo revolution was the use of their non-transcoding routers in the place of traditional MCUs, which allows for massive scalability, transforming VC from something that only exists in fancy meeting rooms, to something that can exist on every desktop and mobile device. In addition to these well appreciated experience and workflow improvements, Vidyo is announcing a new small form factor room system and an updated VidyoPanorama platform. The new VidyoPanorama 600 is priced at ~\$5,000 per screen, supports 6x1080p60 and is significantly easier to install and configure (see above).